One of the best singing reality shows of India, the Super Singer is coming back again in 2019. The language of the show is Telugu and it is broadcasted on the famous Telugu TV channel Star Maa. The show has become widely popular all across the country due to the singing talent which it showcases to the world. 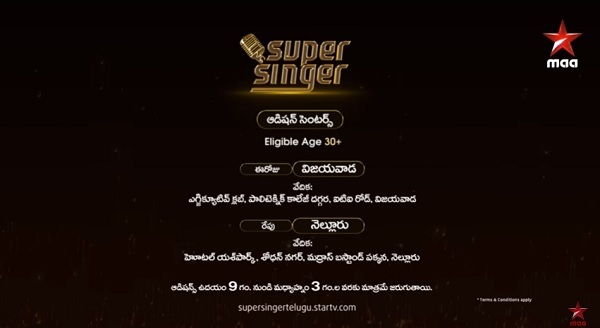 If you think that you have the potential to be the next singing sensation in Telugu, Super Singer is the place for you. A total of 18 participants take part in the show. So, what are you waiting for just go on and register for the show. Registration details are mentioned below. Complete registration details are not yet announced by the makers of the show. You have to visit the Hotstar website for registration after the date of registration is officially announced. After filling up the form, you have to upload the audition video. If the makers like your singing talent, you will be contacted by them. We are going to bring you all latest updates on the show Super Singer 2019. 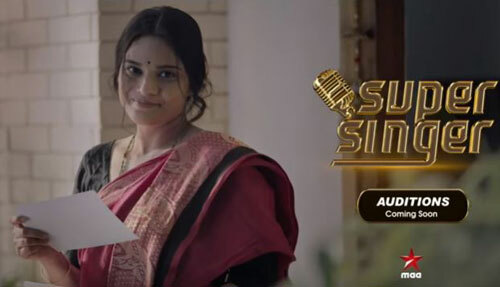 Super Singer Telugu Show on Star Maa 2019 Auditions And Registration are taking place in the different city of south India. The audition gets will be open at Early Morning. And carry the Identity proof/Any ID Proof when you are going to the audition venues. Venue: Royal Fort Hotel, Opp.G.V.M.C, Asilmetta Jn, Vizag. Venue: Executive Club, Near Polytechnic College, ITI Road, Vijayawada. Venue: Meridian Function Palace, Opp.Medical College, Budhwarpeta, Kurnool. Venue: Hyderabad Sarathi Studio Ameerpet, Hyderabad. For the more update of Super Singer Telugu Show on Star Maa 2019 join real-time notification and Facebook. So stay tuned with us for more information on registration.